Permanent Eyeliner does not smudge or smear and provides years of maintenance free enjoyment. Whether you prefer a “barely there” effect – thin, thick or smudgy eyeliner, we customize the artistry to the individual design requirements of our clients. 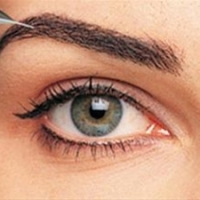 Permanent eyeliner can enhance thin lashlines and make even the thinnest lashes look thicker, fuller and darker. From a soft, natural-looking enhancement to a more defined line – the choice is yours! Framing and balancing the face with a well designed and groomed brow can instantly give lift and emphasis to the eyes, giving a more youthful appearance. To women, the shape, size and color of the lips are a focal point of the face. The tiring experience of lipstick rubbing off, smearing onto the fine lines around the mouth or onto your teeth! Lip liner can be implanted around the mouth making it appear the entire lip has color by gradually transitioning the lip liner color so that it doesn’t appear as a line but as a natural definition around the mouth. Now Offering Services in St. Clair, Michigan, and all the surrounding areas! Jill has been a certified make-up artist since 1989. She specializes in the application of applying permanent eyeliner, brow color, lip liner, and full lip color. Jill is committed to excellence by bringing you the safest new techniques, products, and services by attending industry trade shows and participating in continuing education seminars annually. She conforms to the highest standards for safety and cleanliness for each procedure.